Kashmir Hub offers you a exclusive chance to explore the Buddhist pilgrimages in Ladakh. 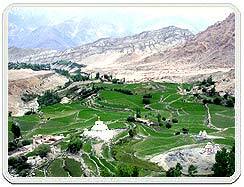 Ladakh is basically a high altitude desert and is one of the most remote regions of the state of Jammu and Kashmir. 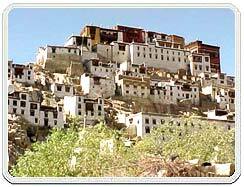 There are more than 100 Gompas or monasteries in Ladakh. These Gompas are religious residences of Buddhist monks who stay here and adhere to the Buddhist way of life, meditate and pray. Tours and travel to these Gompas involves long mountain treks as these pilgrimage destinations are situated in remote places in the interiors of Ladakh. Most of these Gompas are located in remote areas, usually at great heights. Either the Mahayana or the Hinayana Buddhist sects built most monasteries in the Ladakh area of Kashmir. Monasteries in Ladakh are perched on high cliffs. Tours and travel to these Gompas make you conscious of the deep religious influence these monasteries have on the local people. The predominantly practiced religion in Ladakh is the Mahayana Buddhism. Mahayana Buddhism is based on the eighth tenet of the concept of the eightfold part as propagated by Lord Buddha. 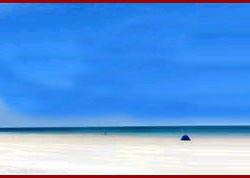 This form of Buddhism stresses on meditation and concentration. One of the most innovative concepts introduced by the Mahayanists is that of the bodhisattvas. The largest monastery in Ladakh is the Hemis Gompa that is situated at a distance of 45 kilometers from Leh, the capital of Ladakh. The Namgyal Tsemo Gompa, which was built in the year 1430, houses a three-storyed statue of Lord Buddha. The Sankar Gompa is also an important monastery. The Dalai Lama inaugurated the Shanti Stupa in the year 1995. The Likhir monastery was built in the 11th century. There are vast clay images of Lord Buddha in this Gompa along with utensils and manuscripts from the olden days. Another old monastery is the Cave Gompa located at Shergole.